The picture was taken sometime between 1947-1953 at Hertford Road Junior School. Sorry I have no idea of the actual date. I have listed some of the people I remember. Maybe you can fill in some of the gaps. If you can, please leave a comment below. 4th Row Down – ?? ?, ?? ?, ?? ?, Angela Norman, Valerie Hamlet, Jennifer Church, Mary Kuhlar, ?? ?, ??? Please click on the photo and a large image will open in a new window. Class from Hertford Road Junior School. The boy on the top row far right is Gerald not Graham and second row two in from the right is Micheal Whitmill. Hello Tracey. Yes, that’s fine – please feel free to add the photo to the school website. Miss Tugwell, or Kathleen as I knew her, was my cousin. She went from Hertford Road school to be Headmistress at Middle Street school, Brighton. She died in 2009 at the age of 84. Anyone still about in this photo, I would love to hear from them. Just to say that the little girl next to me, Loraine Skinner, third row down, is Wendy Hood. It would be nice to know if any of the above gang are still in Brighton. Thanks Tony for this magical memory. 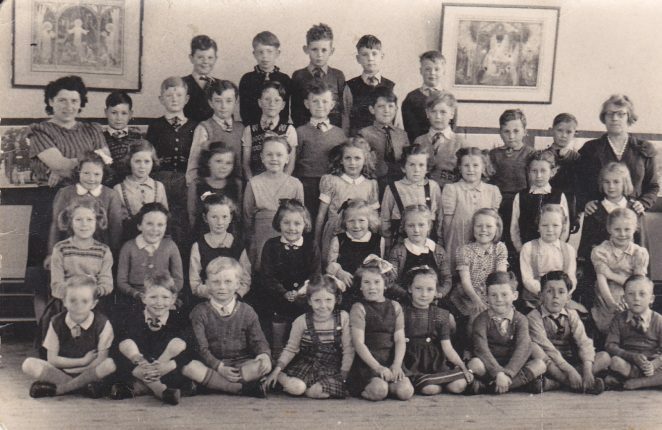 I am in the above photo taken at Hertford Road School, I am sitting last on the left 2nd row from front! I remember Tony Collier, I went to tea with him. I used to live in Hollingbury Place and play with Wendy Hood and Lorraine Skinner! I still live in Sussex but not Brighton now.